ESPRESO is a FEM package that includes a Hybrid Total FETI (HTFETI) linear solver targeted at solving large scale engineering problems. The scalability of the solver was tested on several of the world’s largest supercomputers. To provide our scalable implementation of HTFETI algorithms to all potential users, a simple C API was developed and is presented. The paper describes API methods, compilation and linking process. As a proof of concept we interfaced ESPRESO with the CSC ELMER solver and compared its performance with the ELMER FETI solver. HTFETI performs two level decomposition, which significantly improves both memory utilization and solver performance. To select optimal second level decomposition we have developed a performance model that controls decomposition automatically. This is a major simplification for all users that ensures optimal solver settings. 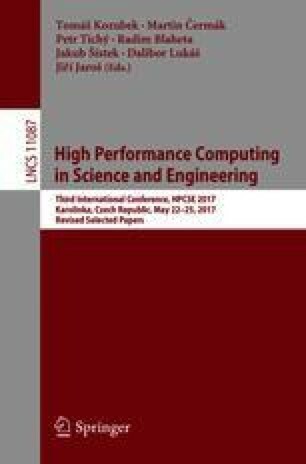 We show that the ESPRESO HTFETI solver is up to 3.7 times faster than the ELMER FETI solver when running on 13 500 MPI processes (the 614 compute nodes of the Salomon supercomputer) and solving 1.5 billion unknown problems of 3D linear elasticity. This work was supported by The Ministry of Education, Youth and Sports from the Large Infrastructures for Research, Experimental Development and Innovations project “IT4Innovations National Supercomputing Center – LM2015070”.